Kalimpong, March 30: Six-hundred-and-forty households in and around Kalimpong have appealed to Prime Minister Manmohan Singh to save them from landslides, a threat that looms large in the hills during monsoon. 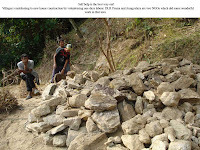 Writing on behalf of the families, Save The Hills, an NGO, regretted that nothing had been done since the end of the last monsoon, which had caused widespread landslides and deaths in the subdivision, especially in early September. “We have written and spoken to numerous government officials, urging them to identify critical landslide-prone areas and commence appropriate prevention measures on a war footing during the dry season. Regrettably, nothing has been done in this regard,” read the letter signed by one member each of the 640 households. The signatures were collected by the NGO in eleven badly-hit areas like Bhalukhop, Alainchikhop, Pudung, Tirpai Bazar and Dungra Bustee. The residents in their letter addressed to Singh in his capacity as the chairman of the National Disaster Management Authority said they run the risk of losing their lives and properties once the monsoon starts. The NGO had last week written to B.L. Meena, the caretaker administrator of DGHC, in this regard. With no government help forthcoming, some residents have dug deep into their pockets to construct walls near the houses to protect themselves against landslides. “We are left with no choice. Actually, the only option before us is either death or financial loss,” said Phup Tshering Bhutia, a resident of Alainchikhop. There was no allocation for landslide prevention in the Rs 30 crore development projects announced by the DGHC yesterday. a) They appear in a local vernacular daily (Himalay Darpan) and the North Bengal edition of the Telegraph. So the readership is limited to North Bengal and no one even in Kolkata, let alone Delhi, is aware of our problem. b) Anyone reading the above reports and indeed savethehills is bound to think that the landslide problem is limited to Kalimpong. That, sadly is not so. 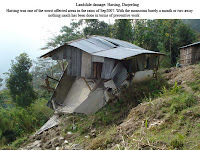 The entire sub-Himalayan West Bengal and Sikkim were battered by the rains in Sep2007 and sustained extensive damage. Unfortunately that is not what the media portrays..
how i wish my friends in Darjeeling and Sikkim would help correct this perspective. c) Last and most astonishingly, out of the Rs 30 crore allocated for development projects in Darjeeling district by the new adminstration, landslide prevention gets NOTHING! A week back, I met 8 gentlemen from Alaichikhop, Kalimpong (refer blog entry of Sep2007). What they told me was all too familiar; they said now that the rains had started and nothing AT ALL had been done by way of landslide prevention in Alaichikhop, they would most probably have to flee their homes and seek shelter elsewhere. All over Kalimpong, in areas which were severely mauled in Sep07 people are now asking how do they survive the next 6 months. And having exhausted most avenues, I decided to do a signature campaign with an aim to alert the Chairman, National Disaster Management Authority. Placed below is the full text of the letter. By way of a brief introduction, I am Wg Cdr Prafulla Rao(retd), Convener of SaveTheHills (STH) which is a group of concerned citizens of the Darjeeling Hills working towards raising awareness about landslides in this area and also requesting the government/NGOs to initiate aggressive preventive action against this hazard. For your information, in Sep2007 we survived a near disaster in these hills and since then STH has posted hundreds of articles, reports and photographs about the landslide situation here on our blogspot (http://www.savethehills.blogspot.com). We have also written and spoken to numerous government officials urging them to identify critical landslide prone areas and commence appropriate landslide prevention measures on a war footing during the dry season. Regrettably, nothing has been done in this regard. Now that the rains have started in the hills, I place before you signatures of 640 home owners in the vicinity of Kalimpong town who fear that their lives/ homes/ and property will be lost to landslides in the monsoon months ahead. Whereas the signatures appended are those from locations around Kalimpong town, there will be many more from the remote parts of Kalimpong subdivision. And if we were to include the entire district, there would thousands. May I fervently request you to kindly intervene? The above letter and 640 signatures of people from the above areas have been despatched today to the PM and the other persons listed , some by speedpost others by courier. As is known to many of the readers, after weeks of political turmoil Mr Subhas Ghising was forced to relinquish his post as Administrator (DGHC) and Mr BL Meena (IAS), Divisional Commissioner, Jalpaiguri took over this post. By way of a brief introduction, I am Wg Cdr Praful Rao(retd) a resident of Tirpai, Kalimpong and convener of savethehills (STH) which is a movement to raise awareness about landslide hazards and its prevention in the Darjeeling hills. 2. As you would be aware, the entire hills were battered by incessant, heavy rains in the first week of Sep07 due to which we suffered a near disaster. From our inception then, we have been insisting that most landslides in this area are preventable to a large extent through awareness and corrective action. This is wholly in congruence with new approach to disaster management which advocates aggressive preventive action and mitigation rather than relying solely on post disaster measures. a) That critical landslide prone areas be identified. b) Short term landslide prevention work such as jhora training and drainage construction be carried out on a war footing during the dry season in these areas so as to reduce hazard to the extent possible in the next monsoons. c) Simultaneously, mid term and long term preventive and mitigation measures be commenced without delay with an aim to mitigate and prevent landslide disasters. 4. Regrettably, hardly any preventive measures against landslides have been implemented from Sep07 till date and in Kalimpong, out of Rs 8crores requested, the Irrigation Dept here has received only Rs38lac which has also been exhausted. 5. The monsoons are around the corner again and most of the areas which were adversely affected in 2007 are much more vulnerable this year; as such should it rain like it did last year, we fear there will be landslides on an unprecedented scale in the district. May we request your urgent intervention in this regard? 6. 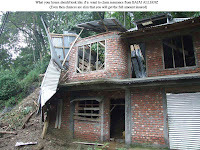 Exhaustive records, photographs and documentation regarding the devastation caused by the Sep2007 rains are available at http://savethehills.blogspot.com for your kind information and necessary action. Gangtok, March 18: A labourer died and three were injured in a landslide at Biring, the construction site of a powerhouse, today, reports our correspondent. The power house is part of the 99mw Chuzachen hydroelectric plant being developed by Gati Infrastructure. Narayan Das (27), a resident of Bengal’s 24 Parganas, succumbed to injuries, while being taken to a hospital, about 45km away. Barun Roy, Mithun Sarkar and Babu Biswas have been admitted to the Rongli primary health centre. The four, while digging earth, were buried under the debris. The labourers would be compensated, a company official said. Even though the death was in Sikkim, the entire area falls into one contiguous geographic region and in the past few days parts of Sikkim and sub Himalayan W. Bengal have experienced a smattering of the first premonsoon showers. Placed above is a scan from today's "Himalay Darpan" (a prominent Nepali daily in North Bengal and Sikkim) about the landslide situation in the hills. The landslides which resulted from the incessant rains of Sep2007 affected villages but the concerned departments have taken no corrective action. This fear was expressed by Mr Dhurba Tamang on behalf of the people of upper Dalapchand. He said that some areas in the vicinity of upper Dalapchand (near the “S” curve) including his home had been severely affected but the concerned depts had done nothing as such chances of survival were bleak during this monsoon. Even after apprising the concerned authorities during the landslides, adequate prevention measures were not in place and the affected people in Kalimpong Block II (Algarah) area were given only 2 tarpaulin sheets. They then wrote to the Irrigation Dept but despite the engineer touring the area and submitting the estimates, no landslide prevention work had been taken up till date said Mr Tamang. He said that he had informed the concerned govt officials that some preventive work should be done before the onset of the monsoons, if not it will be difficult to reside in the affected areas. but just who is listening? Sticking or jamming of doors or windows. Appearance of cracks in plaster, tile, brick, or foundations. Slow development of widening cracks on the ground or on paved areas such as streets..
Breakage of underground utility lines. Emergence of flowing ground water in new sites. Become familiar with the land around you. Slopes where landslides or debris flows have occurred in the past are likely to experience them in the future. Buildings should be located away from known landslides, debris flows, steep slopes, streams and rivers, intermittent-stream channels, and the mouths of mountain channels. Observe the patterns of storm-water drainage on slopes near your home, and watch especially the places were runoff water converges, increasing flow over soil-covered slopes. Observe the hillsides around your home for any signs of land movement, such as small landslides or debris flows or progressively tilting trees. Be observant. Many landslide and debris flow fatalities occur when people are sleeping. Listen to radio for warnings of intense rainfall. Intense short bursts of rain may be particularly dangerous, especially after longer periods of heavy rainfall and damp weather. Unusual sounds might indicate moving debris, such as trees cracking or boulders knocking together. A trickle of flowing or falling mud or debris may precede larger landslides. Be alert for any sudden increase or decrease in water flow in streams or channels. Such changes may indicate landslide activity upstream, so be prepared to move quickly. Be alert for signs indicating land movement. Landslides can occur weeks or months after intense storms. Mudflows tend to flow in channels, but will often spread out over a floodplain. They generally occur in places where they have occurred before. Remember: If you build walls to divert debris flow and the flow lands on a neighbor's property, you may be liable for damages. Take cover under a desk, table, or other piece of sturdy furniture. Try and get out of the path of the landslide or mudflow. Seek the advice of geotechnical expert for evaluating landslide hazards or designing corrective techniques to reduce landslide risk. "India provides striking examples of a bewildering variety of landslides and other mass movements.There have been numerous landslides disasters, unique and unparalleled. In the recent memory, the Darjeeling floods of 1968 destroyed vast areas of Sikkim and West Bengal by unleashing numerous landslides, killing thousands of people. These landslides occurred over a three-day period with precipitation ranging from 500 to 1000 mm, in an event of a 100-year rainfall return period. The 60km mountain highway to Darjeeling got cut off at 92 places resulting in total disruption of the communication system." The base of old landslides provide flat open spaces which are often used by humans to construct new settlements. Topkhana (11th Mile) Kalimpong provides a text book example of this. What was in 1968, the scene of devastation is today a densely populated area. In most cases, the hazard is only dormant and may resurface again as it did in Sep2007 when a long crack developed along the hill overlooking this area. Many residents were forced to flee their houses and take shelter for a week in an open market place..
like so many places I have written about , nothing at all has been done regarding landslide prevention in this area. Kofi Annan, UN Secretary General, 1999. I was disheartened to hear that in the last raining season, Harsing, a beautiful old tea garden, had to suffer for our profanities of nature. Landslides crashed through this village causing heavy losses. My friend Siddartha Pradhan, one of the founder members of Mankind in Action for Rural Growth (MARG) and I decided to visit the place. It was a bright Sunday morning when we set off. A fresh new blanket of snow covered the mighty Kanchenjunga, and the nearby hills surrounded the Darjeeling town like a mother embracing its baby. I attended the Sunday morning mass and stood near Divya Vani, waiting for Siddarth, who so lovingly volunteered to take us down to Harsing in his personal car. Mr. Navin Tamang from DLR Perena and Mr. Montu Gurung from Cathedral of Immaculate Conception agreed to join us too. The air was crisp. However, it got warmer as we descended from Darjeeling to Lebong and had to remove our jackets. On our way, we were greeted by children playing on the sides of the road, women washing clothes outside their houses and some on their way to Darjeeling. The road was narrow and steep. But Siddarth maneuvered well. As we reached Harsing, the local youth team gathered to welcome us. They were helping the landslide victims in constructing new houses. We parked and Mr. Tamang, the captain of the ship guided us up the hill through the narrow path. What a breathtaking experience!! Though we've been born and brought up in Darjeeling, it was difficult for us to keep pace with our other local friends. Soon we reached the first site. And what a sight it was! Around 10 to fifteen villagers were building the house of a fellow neighbour. Some were busy cutting mud, while some were cutting stones. I couldn't see the house which been there earlier. 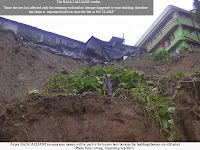 On enquiry, I was told that the landslide had destroyed the house completely. A landslide brings down more than land. It disrupts farms, homes and more importantly, lives. The second site where Mr. Tamang took us was a beautiful mud house with local flowers around it. But its beauty was undone as soon as I entered the house. There was a deep crack right in the middle of the house, breaking it into two. It was deeply saddening. The last site was a badly damaged house which till date, hangs from a hill. My heart was weeping but yet hopeful. And the people that gave us hope were none other than the villagers themselves. They displayed courage and friendliness which shook us all. One family member of each house in that village gave his or her time to construct a house for the affected people. It was a rousing example of teamwork. Even though there were hardships, the faces of the villagers didn't show any. They welcomed us with their glowing smiles and an open heart. However, the hills welcomed us with nothing but echoes of silence. Reverberations of rues. Who do we blame for the tragedy? Everyone knows the answer, but are we really doing something to stop this? This is our wake up call. Let us respect our nature, save our hills. I noticed the work of DLR Prerna and Anugalaya and was truly impressed and moved. They work silently, not for fame. This year too, they are re-constructing thirty one new houses which were damaged in the hills of North Bengal. After the visit was over we were taken to the nearby house and were offered tea. Tea with so much of love and respect. Mankind in Action for Rural Growth (MARG) would like to thank Mr. Roshan Rai, Director, DLR Preryna, Mr. Ashish Rai, Mr. Navin Tamang, Mr. Montu Gurung, Shankar Daju and his team (Shankar Foundation Darjeeling) for involving MARG in Saving the Hills. MARG would also like to thank Mr. Hemant Bhutani and Ms Kamelesh Takkar for donating blankets which were handed to the landslide victims during our visit. Let us all stand up and pledge to Save the Hills and save precious lives. Today we are lucky for not having been effected by these vicious landslides. We are lucky for still having a home. Some were not that lucky. Remember that. Like so many other people, I have been getting my house insured (Householders Insurance Policy) for many years,earlier with National Insurance Company and more recently with BAJAJ Allianz. I’ve always thought; “AT LEAST I'll have something to fall back on” even IF a landslide does take place. So for years the companies have been gobbling up my money assuring me that my home is insured for, amongst other things fire and natural calamities including landslides. Following the heavy rains in Sep07, a part of the retaining wall below my house collapsed, necessitating costly repairs… so I put up a claim (my first one in all these years) to Bajaj Allianz , since THAT, I thought , was what insurance was all about. What I told the company was that in order to prevent much greater damage to my home in the future I would have to get the wall repaired as soon as possible. But rather ironically Bajaj Allianz, like the Government ,does not believe in landslide prevention. Here is the reply I got from the company..
b) Some insurance companies do insure retaining walls (whereas Bajaj Allianz has refused) but then you have to be specific about it. Please grill the insurance agent about specifics and read the fine print before you hand over the cheque. c) Be sure that the insurance company will, in all probability never pay the full amount insured. In such an eventuality – do take the company to consumer court. Having said the above I confess at being a novice regarding insurance and would be glad to have inputs from more experienced people.